When most homeowners notice a pool of water on the ground around their refrigerators, their first response is to panic, but in most cases a leak is the result of a tiny malfunction that can be repaired relatively easily. To get it repaired before more problems occur, however, you need to call a local refrigerator expert fast. All Time Services is the company to call when you discover you have a leak. 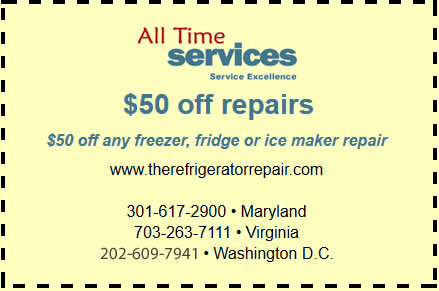 We offer refrigerator leak repair service Virginia, Maryland and fridge repairs in the greater Washington D.C. area and Maryland. With years of experience repairing failing refrigerators, our technicians can quickly identify the source of the leak, repair the problem and inspect your appliance to ensure there are no other underlying issues. There are a variety of reasons why a refrigerator might start leaking. It depends on whether there is a mechanical problem in the compressor or a simpler problem like a leaky drip pan or a missing spacer on your door. Because there are so many possible causes, though, only a professional is qualified to figure out what’s causing the problem and fix it properly. That’s why you need to pay close attention to the circumstances of your leak. Check to see where the water is coming out of the appliance. Is there water coming from between the door seals, condensing on the actual refrigerator? Is the water coming from the back of the appliance near the compressor and motor? Is there water dripping down into the food storage area of your refrigerator, getting on your fresh vegetables and leftovers? Is there water dripping from the front of the fridge, possibly due to a leaky ice maker? These are all common problems and paying close attention to the circumstances of the leak will make it much easier to diagnose and fix your leak when it comes time for repairs. Because a refrigerator has so many parts that work together, it is important to call a professional whenever you notice a problem. A leak could be something simple like a loose door spacer or it could be a sign of a much larger problem in your compressor. The only real way to know for sure and get your refrigerator back to normal is to call a professional. 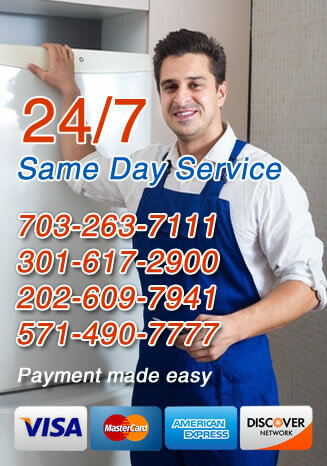 For professional refrigerator leak repair services in Arlington, Virginia, Gaithersburg, Maryland and the surrounding areas, call All Time Services.